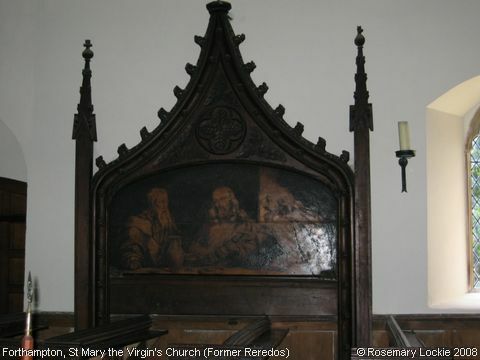 This most unusual reredos was sited originally beneath the east window, and was made by Rev. William CALVERT, curate of Longdon 1842-46, as “poker-work”, which apparently means what it says - a design etched by a hot poker. It depicts Christ between two disciples at Emmaus, and it now makes an attractive feature against the wall of the south aisle. Image contributed by Rosemary Lockie on 5th July 2008.